You probably won't have much trouble finding "something new" to wear on your wedding day. Even the most budget brides typically end up purchasing at least one something new. However, consider that the significance of wearing it is both a lucky charm and a symbol of your future together, this fresh phase of your relationship, and the many fortunes you hope will come your way. Symbolic Ways to Represent Your "Something New"
Here are some creative ways to incorporate the "something new" tradition. Name Monogram: If you're taking your spouse's last name, you'll also be gaining a monogram. Incorporate this monogram into your wedding dress, a sash, or your bouquet ribbon. You could also get a necklace made with this monogram, just your new last initial, or each of your first initials. This last option works as something new even if you aren't changing your name. Lucky Penny: If you follow the tradition of wearing a sixpence in your shoe, it's automatically old—they stopped making sixpence decades ago. But some people instead say "A lucky penny in her shoe." Find a cent coin minted in your wedding year and tape it to the bottom of your sole. Later you can frame it or add it to your scrapbook as a memento. Or, your daughter can wear it as her "something old" years in the future. Shiny Key: If you're buying a home together, or just moving into the same place after the wedding, wear your pristine house key as a bouquet charm, or ask your florist to nestle it deep in your flowers. Photographic Talisman: What could be more symbolic of your future together than a photograph of the two of you? Use your engagement photos to make a photo charm, to wear as a necklace, or tied to your bouquet. Custom Handkerchief: If you're the type who easily cries at happy moments, a handkerchief is a must. Make it personal and something new—appropriate by adding your spouse to be's family crest, name, or another sentimental element. If you call your sweetheart, "bunny," embroider a sweet rabbit. If he's a big Detroit fan, a subtle silkscreened lion will make him smile through any tears. Older Objects Joined: As a gesture representing the joining of two families, your something new could be older objects newly joined together. 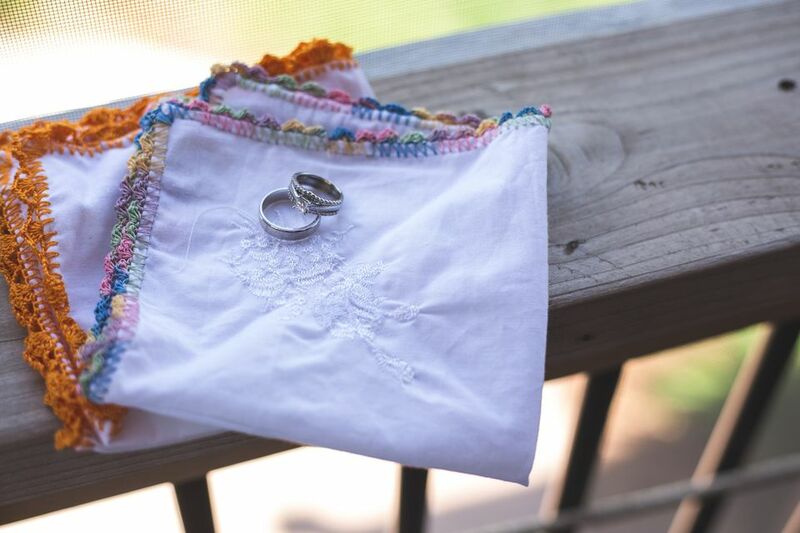 Take each of your grandmother's handkerchiefs and sew them together with a ribbon. Or use pieces of each of your mother's wedding dresses to make a something new wedding day purse. Matching Jewelry: Many brides coordinate their jewelry with their bridesmaids, but you could instead coordinate with the female members of your families. Pick out a bracelet or pair of earrings that are appropriate for you, your mother, and your future mother-in-law, symbolizing the harmony between the families. How Will You Wear Your "Something Blue" Lucky Charm on Your Big Day?